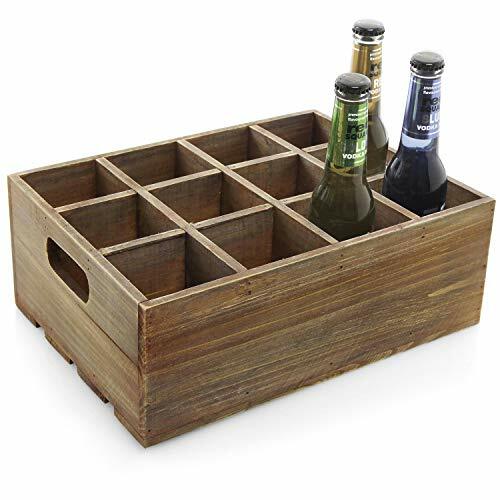 This beer bottle crate is the perfect answer for serving drinks to friends or customers. 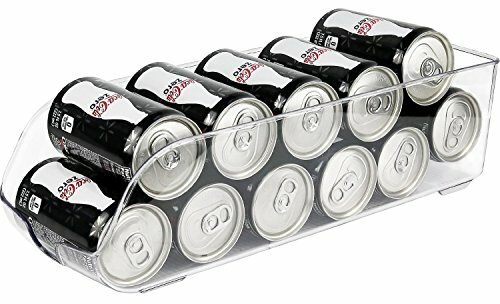 Store bottles of beer in any of the 12 individual slots which keep them safe from clinking against each other and neatly organized. The wooden box itself has been made to be durable and sophisticated, making it not only a useful server but also a rustic decoration. 2 handles allow serving beers out of this box to be a breeze. Brighten up your in-home parties or your restaurant serving with this memorable and sophisticated beer storage box. **Official MyGift product. 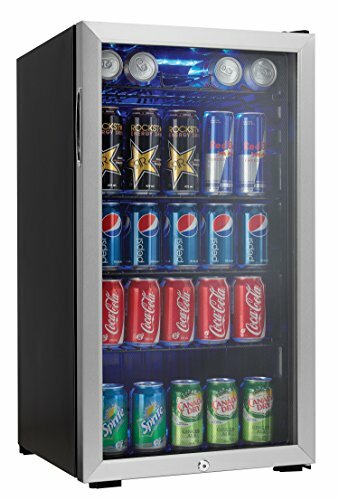 ** Actual color may vary due to computer monitor settings.Approximate Dimensions (in inches): 13 W X 4.7 H X 9.8 D.
If you've ever reached into the fridge for a can or bottle and knocked over other items in the process, or felt that there must be a better way to use the shelf space in your fridge, here is the simple refrigerator shelf storage and fridge organizer solution. 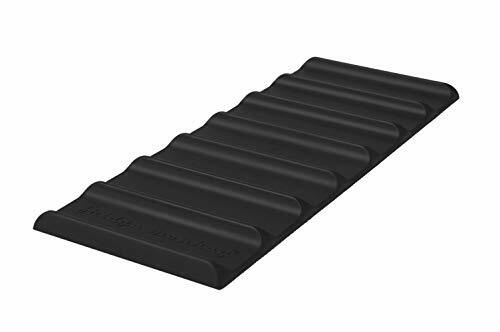 Cooks Innovations Fridge Monkey is a flexible, lightweight, non-slip rubber mat, engineered with 8 ridges spaced evenly to hold 4 12-oz bottles or cans on the bottom layer of your stack, and up to 10 full stacked. 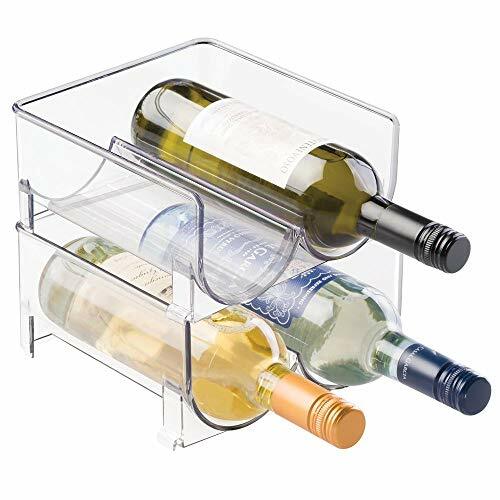 Or it can hold 3 standard sized wine bottles on the bottom of your stack, and up to 6 fully stacked, or any combination of sealed bottles, cans and jars. The Fridge Monkey helps to keep your refrigerator shelves tidy. No more bottle and cans getting knocked over and rolling around. 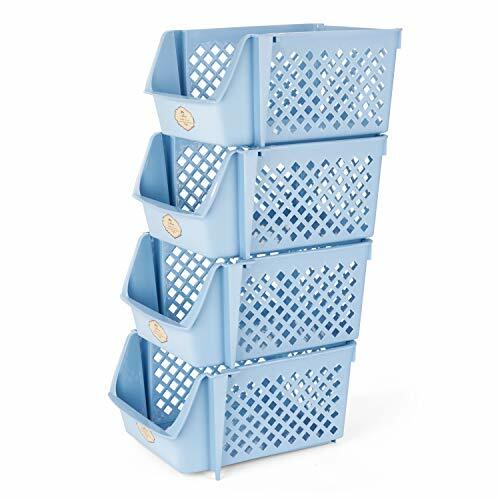 This versatile storage solution is flexible, simple and so sensible, you may wish you had at least 2 of them. The Fridge Monkey is offered in 3 color choices: - Black - specifically, the color is in between charcoal and black - Cream - specifically, the color is in between cream and white - Red - specifically, the color leans a bit toward the orange side of redDimensions of the Fridge Monkey: 9 3/4" x 4"
Keep your refrigerator, pantry neat and organized with this drink holder storage bin. 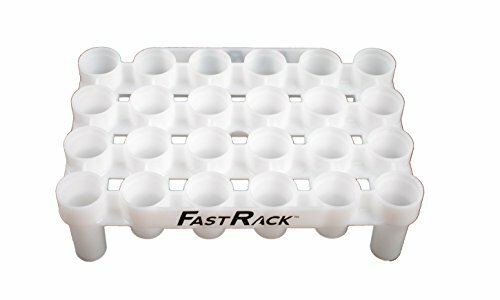 Helps you to neatly organize your refrigerator, freezer or pantry. Made of heavy duty durable BPA free material which won't crack and break easily. 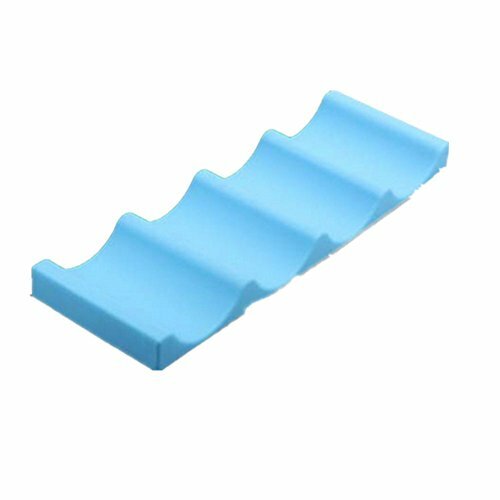 Measurements in inches; 13.5"x 5.5"x 3.75".. Easy to care, wash with soapy warm water. Do not! use in dishwasher and microwave and do not store warm foods or boiling liquids. Cold Beer FlagFlag has metal grommet holes for hanging the flag.The flag is made from a high quality polyester material.Perfect economical choice for both indoor and outdoor displays.Flag is approximately 3 x 5 feet (36 by 60 inches; 91 by 152 cm)Flag is printed on one side, but visible on both sides of flag.Please note that the words will be reversed on the back side of the flag. New and great.From USA - New, Reproduction Tin Sign - Approximate Size: 10.75" x 8.25" - Hand Crafted in the USA - Laser Print Adhered to Tin - Drilled Holes for Hanging About Us: TINWORLD LLC IS A SMALL BUSINESS LOCATED IN THE HEART OF DOWNTOWN VALRICO, FLORIDA. WE TAKE PRIDE IN SELLING HAND MADE COLLECTIBLE SIGNS AT A COMPETITIVE PRICE. WE BELIEVE THAT IN THIS DAY OF MASS-PRODUCTION AND OVERSEAS IMPORTS THERE IS STILL A PLACE FOR AMERICAN HAND-CRAFTED PRODUCTS. Product Guarantee: WE STAND BY OUR 100% CUSTOMER SATISFACTION POLICY. JUDGING BY OUR FEEDBACK, WE TRY OUR BEST TO SATISFY ALL OF OUR CUSTOMERS. PLEASE DO NOT LEAVE NEGATIVE FEEDBACK WITHOUT MESSAGING US BEFOREHAND. Shipping and Handling: Processing: 1-3 BUSINESS DAYS. All orders are shipped out of Valrico, Florida via USPS WITH TRACKING. 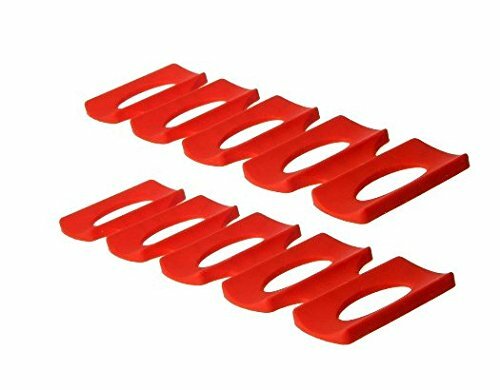 If we are experiencing unusual large order volumes, processing time may take up to 3 business days. Please ensure your shipping address is correct prior to completing the transaction. We are not responsible for the wrong shipping address after the item has shipped. TINWORLD LLC, VALRICO, FLORIDA, THANKS FOR SHOPPING WITH US. We offer both great items and service. We take a look at five beer storage myths to make sure your brews are ready for the season's first BBQ. Homebrew beer storage guide from bottles through to corny & sanke kegs. 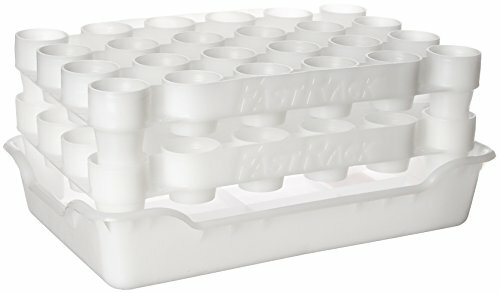 Looking for more Beer Storage similar ideas? Try to explore these searches: Harley Davidson Fuel Door, 6 Speaker Surround Sound Headphone, and Childrens Dragon. BlesDeal.com is the smartest way for online shopping: compare prices of leading online stores for best Beer Storage gift ideas, Beer Storage deals, and popular accessories. Don't miss TOP deals updated daily.